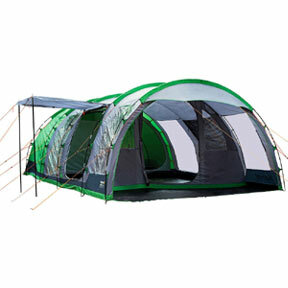 Explore our great selection of camping equipment by Regatta. We offer a variety of tents, such as the Vanern large tents for 4 to 6 people and the festival-friendly Malawi pop up tent range, as well as tent accessories. We also offer fantastic discounts on camp cooking gear, including stoves, pots and utensils, as well as packable folding furniture so you don't need to be sat on the floor. When you're ready to turn out the camp lantern and bed down, we've airbeds and easy electric airbed pumps, sleeping bags (both mummy and rectangular styles), so you can sleep soundly. Take a look, and make your next camping holiday a wonderful one to remember. If you can't find what you're looking for here, you can find camping gear from other brands within our Walking / Equipment / Camping and Survival categories.